So, how's everyone coming with their Holiday Contest entry? You'll be completely unsurprised to discover that I have not even started my sample entry. That is because I still have 5 full days. OMG! I only have 5 days! Quick! This calls for something calming! Oh, look! We have Scotheroos, prepared by the lovely and talented Tina! Okay. Time to get down to brass tacks. First off, the November Pitch Pick. Two very special ponies are rescued in this heroic story of overcoming the odds to survive. Faith was stabled in Spain, where her former owners barely had a kind word for her, much less food. Molly was a casualty of Hurricane Katrina, the storm that devastated an entire American city. Both left terribly injured, Faith and Molly were gifted back their freedom after becoming the first ponies in the world to be fitted with prosthetic legs, thanks to the determination of their rescuers. Saving these two little horses brought together two families across the Atlantic to form a lasting friendship and a bond that can never be broken. Share in the incredible story of Faith’s rescue and recovery, and her treasured friendship with Molly, in this diary-style picture book packed full of beautiful photographs. All funds raised from the sale of this book are shared equally between the two charities that continue to care for Faith and Molly – Easy Horse Care Rescue Centre Foundation (in Spain) and Kids and Ponies - Molly's Foundation (in America). Thank you for your support. Polka Dot Sue is the story of a young girl with polka dot hair, who takes great pride in who she is and conveys this pride with her enjoyment of clothing herself handsomely each day. The story gives a child the sense of self acceptance and pride to show others that a deep sense of self-empowerment come from believing in one self despite obstacles. With the color-emotion awareness, another sense of expressiveness, it encourages the young reader to understand more about feelings with color and self-expression. Also with the encasement the days of the week the story gives the young reader an opportunity of for more fundamental growth. “Good morning world, now it’s day. Time for the sun to come out and play!” Jackson talks him mom into playing the Good Morning Game before brushing his teeth... “Good morning eyes, ears, nose and mouth. Good morning north, east, west and south.” Join these two on their morning adventure from Jackson’s bed as they visit all the animals, creatures in the sea, plants and trees, birds and bees... just to say… Good Morning. Please choose the pitch you think is best and most deserves a read by editor Erin Molta and vote for it below by Sunday December 8 at 5 PM EST. Now then, today's pitch comes to us from Beth who says, "I'm a former first grade teacher turned human development specialist (a.k.a full-time mom). In the early morning and during nap times, I work on humorous picture books and a middle grade novel (with series potential) about a tomboy. I also enjoy making up new words, blogging about the craft, and ending an occasional sentence, like any true Pittsburgher, with a preposition." The Pitch: Mabel is so close to playing baseball she can almost see her spitting distance improving. Mom says all she has to do is stay in the Blossoms troop. But that isn’t easy. She turns a dosido into dominoes. She clobbers the troop leader saving a spider. Then she eats the entire cookie sale stash. Three strikes and she’s out, but that won’t stop Mabel. She sneaks to the Blossoms campsite and finds the Blossoms in a stinky situation only her tomboy talents can solve. 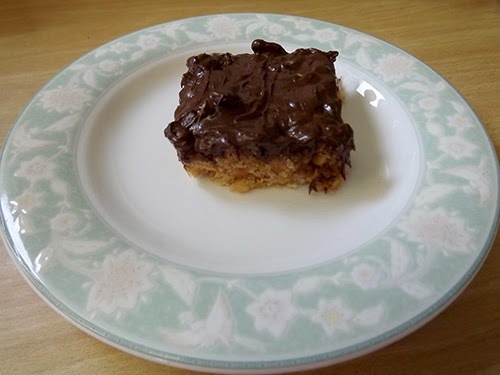 Boy was I surprised, Susanna, to see my Scotcheroo on your blog today! Hmm, I might need to make some more after seeing the photo. Yes, I'd read Beth's book. Sounds full of action. One thing I'm not understanding though is what playing baseball has to do with camping w/the Blossoms Troop. Otherwise, the rest of the pitch is full of interesting action. For me it's a maybe. I wondered why Mabel's mom is making her go in Blossoms if Mabel wants to play baseball. The line about dosido and dominoes sounded a little old-fashioned and a little confusing (I don't think of dominoes as tomboyish). But I love the idea of a tomboy character. That Scotcheroo looks so delicious!! I cast my vote, though it was a tough call. And yes I would read today's WYRI pitch. As the mom of a tomboy myself, I can see this being a story my daughter could really enjoy. Mmm, the chocolate, butterscotch & peanut butter - three of my favorites all in one! Yes, I would read today pitch because I like the idea of tomboy as the MC. But like the others, I was a bit confused. The first line made me think the story would be about baseball, not about her tomboy skills helping out the troop. Tina, your recipe did sound delicious. Thanks for sharing! And thanks for posting about my pitch. Your comments will help me clean it up! Voted! Good choices to pick from. And a Yes for the pitch. It sounds like a very cute idea. For me, I do need clarification on the condition: as long as she stays in the Blossoms for one more year? Forever? What exactly are Blossoms...girl scouts? Fun story though, Beth! Angela, I grew up a tomboy, also! I could never quite find a book with a character like me. Fingers crossed that I can get this pitch right so your daughter can read the book! Thanks! I agree on the dessert...er...breakfast. Sounds yummy! And thanks for commenting on my pitch. It looks like the consensus is that I need to change that first line. Thanks for your input! Thanks, Teresa, for your comments about my pitch. Clarification in the works! Yes... I would read it...sounds cute! But, I agree it's a little confusing. Maybe mention some more baseball related or "tomboy-like things" she does instead of eating the cookie stash, which is not exclusive to boys. I would focus more on the "sticky situation" she helps resolve (maybe a few more clues as to what that might be). Sounds like it might be a funny tale, so bring in a little more of the humor to the pitch if possible. I love Beth's bio- human development specialist aka full time mom- And literally ending with a preposition- HAHA! I like the pitch as well (great opening line, though a few fixes are needed: I find this line a little confusing: "Mom says all she has to do is stay in the Blossoms troop." The "all she has to do" suggests that after she does it, then she can go on to playing baseball. And I don't think that' what she means. I was trying to figure out what a dosido is and then realized that it needs hyphens: do-si-do. And I am confused as to why she sneaks to the Blossoms campsite. Isn't she already there? Otherwise, I love the humor and will love to read the story! Okay, I love love love this, and the last line is phenomenal. Like some of the others, I was confused at the beginning though. I also tripped up over "dosido" and while I like the alliteration of the phrase with dominoes it took a few tries to figure out what you meant. I didn't know what a Blossoms troop was but I got it from context; maybe that's because I don't have girls. :) And the title really threw me...I think a lot of this could be cleared up with a shorter title, one without a colon. The other thing that wasn't super clear was if the Blossoms troop or the baseball was the main story... but yes, this sounds awesome and with a little cleaning up of the pitch I think this will be great! After all those yummy treats, I'm happy to have a dentist keep my smile bright! And as for Beth's proposal, I would read it despite the pitch's flaws because I love a good tomboy saves the Blossom Girls story. But I must say the pitch sounds a little juvenile for middle grade. I would try to spice it up with more of Mabel's voice and determination to play baseball. Play Ball! I voted, Susanna-but it was HARD! They are all so good! Yes, I would read it. :-) I really like the pitch. It's concise and covers the key points. Great job, Beth. "Human development specialist" lol, I love it! Thanks for every thing, Susanna. Regarding the pitch, I would read it, with a caveat. I think the structure of the pitch is sound. I love the tone, clearly going to be a fun read. I can picture Mabel knocking down all the dancers (very funny). But I am a wee bit concerned about the whole "tomboy" thing. I think it's fantastic to write about a girl who likes baseball and doesn't fit in with the flowery camper organization, but I'd be sure to clarify to the editor I wasn't stereotyping the MC. My daughter was continually frustrated by books which portrayed sporty girls as awkward, crude, or unfeminine. She would've loved a book which depicted the girl characters as both sweet and active. Great job. Go for it! Wendi, thank you! Very good points. Getting humor in a pitch is so hard for me, but I'll keep working at it! Iza, I'm glad you got the humor in my bio! Now if I can only get that humor to come across in the pitch as well! I'll work to clear up the confusing parts you mentioned. Thanks! I'm so glad you love it, Wendy! With a few tweaks, maybe you'll like it even more! Thanks for the suggestions! As for the title, I'm hoping the book becomes a series (called Tomboy Rules) and this is just the first book (called Blossoms are Always Prepared). Do you (Wendy or anyone else) have any advice on how to pitch it so the title isn't distracting? Thanks, Juliana. I'll work on it! GREAT thinking point, Joanne. One of Mabel's problems in the story is that she is labeled a tomboy by her sister. Mabel really struggles with being labeled this way. I'm going to have to play around with the pitch and see if I can work that information into it. Thanks so much! I LOVE the voice in this pitch, but am totally confused, maybe because I don't get baseball? So I would read it based on the voice, and hope I figure out what's going on along the way. I've been hoarding the Scotcheroo, Tina, just biding my time and waiting for the perfect moment :) Thank you for sending it to me :) And thanks for your comments for Beth! You have entirely too much faith, Teresa. Every time it's a nail-biter as to whether a story will get written at all! :) Thanks so much for voting and for your comments for Beth! I chuckled over that too, Iza! :) Thanks so much for your helpful thoughts for Beth! What a good point, Joanne! Thank you so much for sharing! The spitting distance part pulled me out of the story a bit even though it shows her tomboy character (but if no one else mentions it ;)) The rest I love! A definite YES! Like many have said, I love Mabel's voice. I survived last year having to take a 6 yo to Daisies (a young division of Girl Scouts) and so the pitch made a lot of sense to me. The cookie sales! The "stealing"of said cookies when leaders weren't looking!! Maybe refine the word tomboy. Mabel just isn't a girly girl and that's fine. Best of luck with this one! I love the pitch. Yes, I would read it. It's clear that there's a humorous voice, action, and a sweet solution. I was a little confused when you mentioned tomboy at the end. Perhaps you could just say that it's a situation only Mabel can solve? That said, I think it's strong enough to get an agent or editor to turn the page. Good luck with this! Yep, I'd read it. I do think though that all your short sentences, one after the other, don't let me get involved as much as I'd like to. Perhaps joining 2 or 3 of them together into something like ... 'after turning a dosido into dominoes, clobbering her troup leader in a spider-saving moment and managing to eat the entire ... ' might give you a little more variation and flow? Oh, dentists! Melissa Guion had a hil-LAR-ious PiBoIdMo post about dentists, genius and Percy Shelley. Probably not a PB-friendly experience, though. Beth, I love the humor in Mabel's antics. And the potentially "stinky" climax. The source of the confusion, though, seems to be the stakes. What is the main conflict of the novel? Does Mabel have to stay in the Blossoms to play baseball? Whatever the main conflict is, I'd state it (with Mabel-esque attitude), use the antics to support conflict, and hint at what the stinky climax might be. Ah! Total confusion is not good! Glad you like the voice, but I'll keep working on the pitch. Thanks, Julie! Linda, I survived a short bout in Daisies myself. Barely. Just kidding, but I probably did draw on that a little for the story. Thanks for the word choice advice! I love that wording, Pam! And I sure hope you're right about getting an agent or editor to turn the page! Hmm. Thanks, Steve. I think I was going for short. And punchy. But. I. Overdid. It. Good eye! Stacy, way to narrow down the source of confusion. You've just made revisions of the pitch a lot easier for me! Thanks! Love the voice and some of the antics. Not sure why she has to stay with the troop to play baseball? The pitch seems more about the troop than her efforts to play baseball. If she wants to play baseball so badly (the spitting part) then why can't she keep herself under control to reach this all important goal. And, I could totally be Mabel eating a cookie stash or eating Tina's Scotcheroo! Hope you didn't eat a Scotcheroo before the dentist! Ready to get my holiday entry scheduled to appear on Monday :) My reward for getting this task completewas stopping by for WYRI! Good luck Beth. Luckily I survived the dentist :) Thanks so much for your very helpful thoughts for Beth, Stacy! Hi, Beth--I wasn't familiar with the term "spitting distance" so that confused me a little, and I had to figure out the dosido to dominoes part, and I don't see how joining a troop will help her get to play baseball--but then, I'm easily confused. I love the idea of Mabel solving a stinky problem, though, so maybe the pitch could feature that more prominently? Sounds like a fun and feisty character! Sorry, I'm late again. But, I did vote. Love the pitch today. Sounds like a rollicking story. Would like to know a little more about the main conflict. Beth, I LOVE your story concept, first sentence and last sentence...but I need to have more clarity about why she needs to stay in Blossoms in order to play baseball. Is this a rule of her mom's? Or of the troop? Or the baseball team's? I like that she will have to push past the rules a bit (sneak into Blossom camp) in order to save the day. I would definitely read this! Beth, your story sounds interesting and humorous. I agree with Steve to join those three sentences together. There were quite a few sentences with "she". Thanks so much for sharing your thoughts for Beth, Pat! And no worries about the timing - there's no such thing as late around here :) and it's very kind of you to find time whenever! Stacy, congrats on finishing your holiday entry! I feel like the reward was mine, though. Thanks for the comments! Pat, it sounds like you're not alone in wanting to know more about the stakes. I plan to include that in the rewrite. Thanks! You're right, Rachel. It is amazing what a pair (or lots of pairs) of fresh eyes can catch! Thanks! Thank you, Susanna, for WYRI and for putting my pitch in this post. Thanks to everyone who read and/or commented on the pitch. I'm really honored that you all took time out of your busy days to help me! The feedback was amazing and I can't wait to get back to work on the pitch! You're so welcome, Beth! I'm glad it was helpful to you. We are really fortunate to have the absolute best bunch of readers here - they are so generous with their time and expertise! Thank you for bravely pitching!